I hate to have to write this blog but it has to be done. I have had so many email me privately wondering about Hubby. Well he is not doing good at all and I think the Doctors are going to pull out all the tubes and let him come home with an aide from Hospice. He so wanted to come home. He seems to have gone downhill very fast and why prolong something that is not good or will be good. , Our son is flying in tomorrow to spend a little time with his Dad. Hasn't seen him since last summer. Now on to what I have been doing. 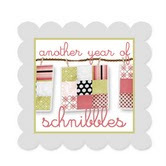 Here is the second Schnibbles with this pattern for me . I finally finished the binding today at the hospital. I took this picture with it hanging on Hubby's wheelchair. This is the one I have going now. It's called Tagalong,I still need to sew the inner white border on and then the pieced outside border. This was made with Garden Song by Nancy Halvorsen. I had picked it because of the plaids, stripes and I think it has turned out good. These are the blocks I have made so far for the 2010 Thimbleberries club quilt. There are some different blocks and I have them set here on the board where they go in the main part of the quilt. There are three more stars and another house. Not sure if there is more. But then there are the borders. Fun to watch it go together. It's great the way our quilting helps to keep your mind in a good place. 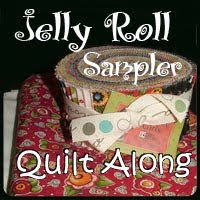 I really don't know what I would do without my quilting and my online friends. I need to talk to someone I just come to the laptop. Thank you all for being my friends. Our passions and pass times help us through the most difficult times. My thoughts and prayers are with you and your husband. My thoughts and prayers are with you and your family daily. Big hugs!! I'm praying for you & Unc Geo. Sorry to hear he isn't well. Well, you know--I've already written to you about your DH. I'm really pleased to see your Schnibbles quilts though. Both of them look terrific and your selection of the Halvorsen fabric for the Tagalong is so much better than what I'd picked--mine just blended together. I'm glad you have your quilting during this tough time. Hugs to you! So sorry to hear the news. My prayers are with you and yours. Here is a big huggggggggggg. Eileen you and George are in my prayers. I pray that he doesn't suffer and gets to enjoy ythe kids this weekend. Take care of yourself and remember we are all here for you. Sending a big hug for you to carry in your pocket to pull out when you are tired, stressed or a little TLC. Sending you a big hug and warm thoughts, dear lady. May You find yourself surrounded by loving friends and family who are there to help carry you through your difficult times. I wish your Geo some pain free days and the opportunity to spend some good times surrounded by his loving family. Sometimes as I quilt, I see in my mind's eye a long line of women reaching back a couple hundred years or more working into their quilts their hopes and fears, their sorrows and joys. And so many times, I have quilted similar troubles and hopes into my own, pouring my heart out to God with each stitch and snip. Quilting is such a gift. I am sorry to learn of your dear hubby's troubles. It sounds like being at home will be most comforting to him. Take full advantage of Hospice. Usually, they are fine and helpful people. You and hubby are in my prayers, Eileen. keep busy with your stitching. I am so sorry to hear about your husband. I sincerely hope that the next few months are as peaceful as possible for you and your family. Sending good thoughts and prayers for you and your family, Eileen. Eileen, My prayers for you, George, and your whole family will continue on. I'm glad you have your quilting to work on. Be kind to yourself and rest when you need to. Such a talented lady! Your quilts are beautiful! Prayers for love and comfort to you both.